"Dr. von Hayek, in the 30 years since World War II, some nation's economies have done very much better than others. West Germany, for example, has done much better than Great Britain. Are there any generalizations that you can draw from these? What is the secret to success and the secret to problems?" "Well of course it's a very complicated issue but there is one simple point: the German trade unions were extraordinarily sensible, and they were sensible because they remembered what inflation meant. However, there's a certain implication; this sense may not last long, because the generation which remembers it is now going off. I'm rather apprehensive about the future." "Dr. von Hayek, we have a basically conservative administration in the United States today, but even it is facing planned deficits (more or less planned deficits) exceeding perhaps $100 billion in the next two years. Do you think this will cause a renewed and perhaps socially destructive inflation?" "It's not unlikely, I'm afraid. So long as the governing people are persuaded that inflation of this sort is even beneficial in its effect, the tendency in that direction will be very great. I think it all depends on persuading the responsible people of the danger of inflation." "Dr. von Hayek, you talked in response to Mr. Levine of a painful adjustment of the unpleasant effects that we would have to endure in order to beat inflation. With all due respect, sir, aren't your theories somewhat unrealistic in a political sense? Do you visualize governments today being able to take such steps as you recommend?" "Perhaps I'm unrealistic. As long as people do not fully realize the danger of inflation, they may well pressure for more inflation as a short-term remedy for evils. Though we may well be driven into more, until people have learned the lesson, but that means that inflation may still do more of a great deal of harm, before it will be cured." "Well to be specific, what rate of unemployment do you think that this country ought to be willing to tolerate in order to beat inflation? Twelve percent, fifteen percent?" "It's not a question of what the country is willing to tolerate. The longer you have inflation, the more greater unemployment becomes inevitable. We will have no choice. It's all the matter that government can't avoid the unemployment which is caused by the previous misdirection of labor, which the inflation has produced." "But when you speak of unpleasant effects, just what are you talking about that the country would have to endure? It must be some level of unemployment that you're thinking of that would result if we do cure inflation." "Well, a period of inflation, not a lasting inflation. When if you want to achieve a tolerably stable position, you really have to go through a period of inflation, which would put off unemployment, which may well last more than a year." "And how high could that get?" "I couldn't say. I mean I would have to know much more about the specific conditions, but it would not exclude a temporary rise to thirteen, fourteen percent or something of that sort." "Do you think the social fabric of this country could tolerate a fourteen-percent rate of unemployment?" "For a few months, certainly." "Professor von Hayek, your fellow Nobel laureate, Professor Leontief, is an advocate of planning, and two of our prominent senators, Humphrey and Javits, have introduced legislation to implement his idea, which is largely a matter of study by various government agencies and recommendations — nothing compulsory. Do you see in that kind of planning the same dangers that you see in a more mandatory form?" "Well if it's really nothing compulsory, it would also be completely ineffective and therefore would do no harm. I think there's a very simple answer. He really imagines that somehow people are being made to do what he is planning." "The thought, I believe, that they have expressed is that such things as foreseeing shortages of industrial productive capacity could be highlighted, and the industries encouraged to go ahead with building new plants, that sort of thing. Do you encompass that in your thought that it would be completely ineffective?" "But why call that planning? If you can give industry better information, by all means do." "Can we then say you would support that legislation, despite your fears of planning?" "Well, there's nothing to do with planning." "Dr. von Hayek, did I understand you to say in answer to Mr. Levine's question that the way to stop inflation is to stop the printing presses? Now are you suggesting that that's what we're doing here, that we're just printing money, and that's the way this inflation has started, and that's the way this is continuing, and that's the way it will continue?" 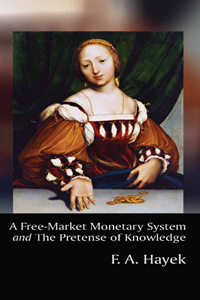 "The sentence, 'stopping the printing presses,' is a figurative expression, because it is being done now by creating credit by the Federal Reserve System. But this is government action — all inflation is ultimately the result of activities which government determines and can control. And all inflations have been stopped in the past by the government stopping creating money, or preventing the central bank from creating more money. May I add just one thing? See, all inflations have been stopped by people who created or believed in a very naive form of the Quantity Theory, and acted on that. It may be wrong, but it is the only adequate theory effective to stop an inflation." "Now you have been a student, I'm sure, of the United States because you've taught here for many years. What do you think has started our inflation? We've had inflation for a number of years, and I don't think that we were printing money at that time, or that the Federal Reserve was necessarily dumping a great deal of money. What do you think was responsible for the beginning of our inflation?" "The belief in the deliberate increase of aggregate demand, as a means of creating employment. In effect, what's popularly called belief in Keynesian policies to create employment." "Dr. von Hayek, the general belief among administration economists now is that we are near or at the bottom of the recession that we've been going through. Do I understand you to be saying that we should be willing to experience a continuation of this period of low economic activity for another year or so rather than to take the kind of efforts that the government has taken — of a tax cut in order to stimulate the economy?" "The tax cut again aims at increasing aggregate demand and the present difficulty is not due to a deficiency of aggregate demand. It is due to the fact that without continued inflation, you cannot maintain the people in the new employments in which they have been drawn by the inflation of the past." "I would like to pursue the first part of my question: do you see a necessity, in order to avoid a resurgence of inflation, that the government undertake policies which will continue us at the present low level of economic activity for a period of a year or more?" "Well not necessarily at the low level, but we should not produce more than a very slow recovery. I would like to add, the slower the recovery is, the better are the chances that it will last." "In a speech before a congressional group not long ago, you said that the threat to the free-enterprise system of our society has never been more imminent than it is now. What did you mean by that?" "Well because I am afraid that government will continue to inflate to combat unemployment, and we tried to meet the effects by imposing price controls. And if you use price controls for that purpose, you are driven into a centrally planned system." "Thirty years ago when, Dr. von Hayek, you stressed, and have subsequently stressed, that political and economic liberties must either flourish together or perish together. Do you see signs — specifically in the United States today (or in Great Britain, with which you're familiar) — that political liberty is endangered?" "In Great Britain certainly, and it is quite clear that by the established democratic process, you cannot conduct the kind of economic policies the present governing party wants to conduct. For the danger of a reduction of political liberty in Great Britain is considerable. This country is not so imminent, very largely for the reason that the efforts have not been directed so much towards nationalization and direct government controls of industries. But the attempts have been made by a redistribution of incomes by taxation. And that is a much slower process. I think it tends in the same direction, but much more slowly than the other one." "Dr. von Hayek, how do you rate the impact of market power wielded by either unions or corporations as a factor in inflation? You seem to be putting all of the stress on the quantity of money and the printing press. Isn't part of our inflation and part of the inflations in some other parts of the world due to excessive market power of labor unions and corporations?" "Never directly. Well it may well be, and frequently happens, that because of the power of the unions as well as the corporations government feels compelled to inflate. It becomes the inducement for government action. But the immediate cause is always the increase of the quantity of money by government, whatever the inducement to do so." "Well now returning to the crisis in Great Britain, the chancellor of the Exchequer told me on Wednesday that the Cabinet will consider a return to a formal wage-price-incomes policy. What effect, if any, do you think that would have on the very high level of British inflation in wages and prices?" "I don't think it will help at all. See, it might be necessary as a temporary measure, at the moment when you are in a position to stop the increase in the quantity of money. I do not see any prospect at all in the near future of the British government effectively stopping an increase in the quantity of money. In that situation, you just disguise the effects of inflation for the time." "What would be your prescription for the ills that afflict Great Britain?" "Well it's a problem of first persuading the public that, in the present situation, the pressure of the trade union does not deserve public support. That you must achieve before you can do anything by legislation reducing the powers of the trade unions. It must be a long process. I don't see any immediate cure." "Professor von Hayek, you have always stressed government actions that inflate and government planning and controls as the great dangers to our political freedom. Many Americans see another scenario for loss of freedom in this country, which is economic policies that now have unemployment in the center cities among black youths over forty percent, and that their anger and frustration can lead to violence, which in turn will lead to repressive governmental action. What do you say to that scenario? Can we just sit idly by and let that happen?" "No, but it goes back to the same cause. The unemployment of which you speak, which is the initial cause, is due to labor being temporarily directed into places or activities or industries where they cannot be maintained without further inflation. Therefore you can only cure that by achieving a new redistribution of labor between employments. Adaptation to a condition in which aggregate demand need not progressively increase to maintain that employment." "But you have said in everything you've written and said lately that this is a lengthy process, that we won't get back to stable money quickly. Meanwhile, what do you do with these urgent problems and human hardships?" "We mustn't assume that all problems are solvable in the short period. There are problems that we cannot solve or which trying to solve them quickly may do more harm than good." "But in the meantime, what do you do with the human hardship and the mounting rage that is certainly building up?" "Well, I don't think there is anything I can do about it. We'll have to tide over the storm which may be threatening." "Dr. von Hayek, may we get a bit specific on one particular thing, and that is Great Britain? You're a citizen of Great Britain; you've taught there, and I think you know something about the economy there. As I understand it, their inflation rate may hit as high as fifty percent. What is the consequence of something of that kind? What do you see is going to happen in the country of which you're a citizen? "Well you get a very severe economic crisis with fairly extensive unemployment, the moment inflation stops. It will probably have repeated attempts to restart the process by returning to inflation … would probably combat the wrong thing — the effects of inflation on prices by price controls — that will lead to a centrally directed economy, which will weaken the international economic position of Britain even worse. And that will probably result in the position that somebody may decide that the direction of economic policy has to be completely changed. I almost hope that the severe crisis will come soon. There won't be a long dragged-out process of misery. But I don't see any immediate chance, with the present political situation in England, of such a complete change in economic policy as would be required." "Are you saying that England is either going to go bankrupt or that England is going to become a dictatorship? What specifically do you mean is going to happen in Great Britain?" "The English people are beginning to experience, which they hardly have yet, but they have become very much poorer and are rapidly getting poorer still. And that will lead to the resolution or the recognition that the policy of the past was wrong. The amazing fact is that the great majority of British people are not yet consciously aware that they are living in a very severe economic crisis. For that reason, they are not willing to consider seriously a complete change in policy." "Well but what do you think is going to happen since you believe that? What's going to happen there? Are they going bust?" "No country can go bust. All that happens is that economic conditions of daily life are getting much worse, so there will be scarcities. People will find that their income is no longer sufficient to maintain their standard of life. They will come to distrust first the present government and present policies, and may then be willing to return to an altogether different system. But I'm no prophet; I can't say how soon it will—"
"And do you think that if we follow along our present footsteps that the same thing's going to happen to us?" "Yes, but in ten or twenty years' time, not a problem for the immediate future." "Dr. von Hayek, to try to translate some of the things that you've been saying into the terms of the pocketbook of the average American, what advice would you give an American with savings of twenty, thirty, maybe one hundred thousand dollars? What should he do with that money to protect it against the problems of inflation that you've been discussing?" "I still believe there is nothing better than putting [it] into equities, although even that doesn't promise him today that it would actually preserve it, but it would give you a good chance of preserving a substantial portion of it." "Dr. von Hayek, these theories that you've gained such recognition for over a period of years have warned consistently, as has been pointed out, of the dangers and threats of inflation. And yet this country has undergone inflation for a great many years, and the standard of living has consistently increased. Does this lead you to question in any way your thesis?" "Not in the least, because the dangers of inflation are very different ones. They are exactly the kind of unemployment which is now arising. In the usual discussion, there is quite a wrong emphasis. There are many bad effects of inflation, but the worst is that it draws labor into employments where they can be kept employed only by an accelerating inflation. And the point inevitably arises where inflation cannot be accelerated sufficiently fast to keep them in that inflation. We just make one short…the inflation is like overeating and indigestion. Overeating is very pleasant; so is inflation. Indigestion comes along only afterwards, and therefore people do not see the connection." "Dr. von Hayek, capitalism and particularly American capitalism would seem to have a good record at giving people a rising standard of living. Why are so many intellectuals, and particularly so many economists, skeptical about and even hostile to capitalism?" "Well, I've been puzzling about it for a long time, particularly about the economists who ought to understand better. It's very difficult to know why they don't. I think it's the intellectual attraction of a system you can deliberately control, which is fascinating to the intellectual." "Dr. von Hayek, coming back quickly to Great Britain, isn't it possible that if we pursued your philosophy and theory, that we might destroy capitalism there rather than save it, looking at the analogy of the Italians?" "No, it's not likely to become worse. The present tendency would destroy capitalism inevitably. I think the important thing is that people are given a chance to change their minds, before it is irrevocably destroyed…"
"I'm sorry to interrupt, but our time is almost up, and we won't be able to get in another question and another answer. Thank you Dr. von Hayek for being with us today on Meet the Press." [bio] See her [AuthorArchive]. Comment on the blog. This transcription of Friedrich von Hayek's June 22, 1975 interview on "Meet the Press" first appeared on JohnLocke.org. The full audio link may be accessed here.